I've gotten very little done in the way of new cards for the last few days so it's a good thing I had worked ahead on my DT commitments for the upcoming week. :-D Usually, I post something nearly every day but I missed yesterday and won't have anything else until Tuesday. I am going to share a couple of quick birthday cards I did for my stash today but that's about all I have. Well, I could share with you the reason I haven't gotten many cards done or posted. I've been involved in starting up a new challenge blog! It's called 2 Crafty Critter Crazies and our first challenge will be going live on April 1 (no, not an April Fool's joke!) We're a true "Anything Goes" challenge in that it's not limited to cards or even just paper crafts. You could enter mixed media, paintings, crochet, quilts or other fabric projects, whatever your heart desires! The one requirement is that your project MUST have a "Critter" featured on it. We define "Critters" as any animal with fur, feathers, fins, scales, even insects, as long as they are the featured item on your project. OK, here are the two cards I managed to get done this morning. For this one, I based it on the sketch at Sketch Saturday. No images and no coloring today. I was playing with my latest dies. On the first card, the "Happy Birthday" is from a die by Lawn Fawn which actually says "happy birthday to you" but I cut it down. 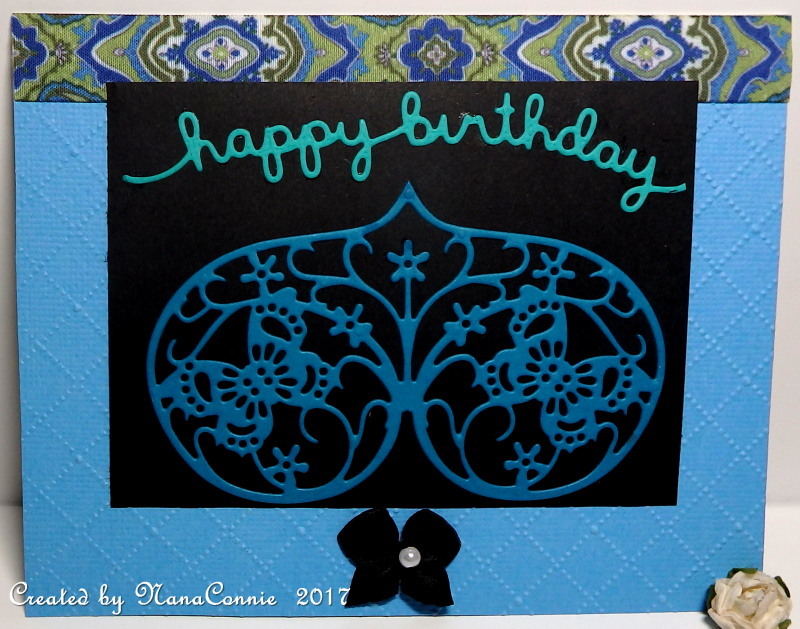 The other die cut is from a die by Tutti Designs, my first die from that company. 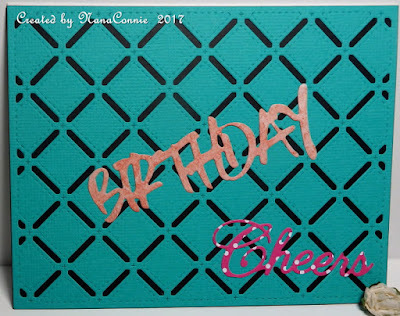 On the second card, the "Birthday" is by CUTplorations (STAMPlorations) and the "Cheers" is by Cheery Lynn. The background cut is from a die by Memory Box. How exciting for you, sounds a wonderful concept. Will have to have a looky on April 1st. GREAT cards today, lovely ideas and colours. Both cards are great! Love the dies you used on these!!! The new challenge blog is fantastic looking and I can't wait! Hey, I get to see two cards from you today! ; ) That Tutti Designs die is really pretty; love how you used it on your card. On the 2nd card, I'm still enamored with the die from Memory Box! So excited for your new Blog...I'm going over to check it out now! But first, let me do official business and thank you for joining us at Cut It Up for our Happy Birthday Challenge! Good luck with your new challenge blog! Sounds like fun. What a pretty birthday card to have in your stash. Thanks for sharing it with us at Cut it Up Challenges. Congrats on launching your challenge blog, look forward to checking it out in early April! Thanks for taking the challenge at SKETCH SATURDAY!! This is very pretty. Love the colors. Thanks for playing with us at Jo's Scrap Shack. Always Stretch Before Any Exercise!